If we have left over rice (and we don't forget it in the rice cooker) then the next day we usually like to use it for a fun dish. Sometimes we make fried rice for dinner and sometimes I like to make rice pudding. However, this isn't your normal rice pudding. I like my rice pudding with a little more flavor than normal rice pudding so this version uses a few swaps to amp up the flavor. 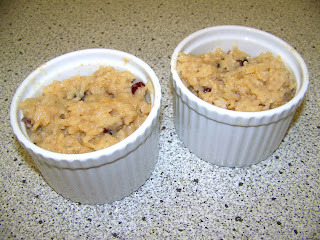 In a saucepan, combine 1 1/2 cups cooked rice, 1 1/2 cups milk, sugar, salt and craisins. Cook over medium heat until thick and creamy, 15 to 20 minutes. Stir in remaining 1/2 cup milk, stirring constantly. Remove from heat and stir in butter and honey. You can serve this dish hot or cold with a dusting of cinnamon and nutmeg on top. Enjoy! Yum! I like the addition of the craisins.